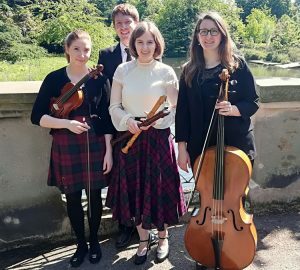 E nsemble Hesperi are performing at Stroud Green Festival in North London on 9th June, with Magdalena Loth-Hill (Baroque Violin) and Florence Petit (Baroque cello). They will be performing all-new repertoire from eighteenth century Scottish composers, including a beautiful trio sonata by the intriguing Earl of Kelly, also known in Scotland as ‘Fiddler Tam’! Most excitingly, this concert is also the first showcase of their Highland dance workshop and concert, ‘The Pheasant’s Eye’. In the afternoon of the concert there will be an audience workshop, where participants can learn some basic Highland dance steps and 2 short dances which they will be able to perform later in the concert!